As We Enter This New Year… The Lord Will Be With His People! December 31, 2015 7:00 pm / 3 Comments on As We Enter This New Year… The Lord Will Be With His People! Isa 42:16d KJV – “These things will I do unto them, and not forsake them. Folks, as the New Year comes upon us, we are reminded that we are embarking on a new part of our life’s journey that is filled with many unknowns. These unknown events can challenge a Christian’s faith to its very core. This is the reason that I felt it was important to take a few devotional lessons and address keys to “Entering The Unknown By Faith”. In this six part devotional series, we will be looking at Isaiah 42:16. This is a wonderful text to use in this devotional series. In this series, we will learn about how to handle unforeseen, challenging life events based upon our trust in the Lord and His enabling graces. Lord willing, by His grace alone, we will be uncovering the wisdom found in God’s Word that will help us to handle all the “unknowns” that this New Year will hold for us. 1. Dec 26th – Our Uncertain Future…. Faith Is The Key! May the Lord bless our study! The Lord promises He will care for us in our future situations. He will not turn His back to us. Throughout this series, we have seen the Lord make a series of promises to His people…. 3. “I will make darkness light before them,” – He will reveal to us our future events in His way and in His time. A. Our Lord is in absolute control of our lives and every event that enters into them. B. Everything that will take place will be either sent or allowed to come into our lives and they will result in our benefit and His glory. C. He will never walk away from us or turn His back on us. He will always be there every step of the way. Folks, as we enter into this New Year, if we have a living relationship with the Lord God, Jesus Christ, we have nothing to fear, nor do we have reason to be anxious or concerned… He has promised us these things and reaffirmed them to us several times in His Word. We can count on Him to keep these promises to us. May the Lord bless each one of us with His grace and peace as we enter this New Year trusting Him every step of the way! Remember, O LORD, thy tender mercies and thy lovingkindnesses; for they have been ever of old. The Lord Clears The Path For Us To Follow Him! December 30, 2015 7:00 pm / 2 Comments on The Lord Clears The Path For Us To Follow Him! The New Year will hold situations that make the course of our lives very difficult to negotiate. At times, our paths will be so twisted, we will not be able to see where it is taking us; at other times, it will be so confusing, we will not know what our next step should be. As we begin this New Year, let us enter it with a Godly attitude of humility and appreciation for His enabling graces during the crooked times of our lives. The Lord Reveals Our Future In His Time! December 29, 2015 7:00 pm / 5 Comments on The Lord Reveals Our Future In His Time! The Lord promises that He will reveal what lies ahead for us in His time and in His way. What a blessing that is for each of us! The Lord, who knows what our tomorrow holds, would only allow us to face our trials in life after He had worked in our hearts, matured us, and strengthened us in preparation for the trial that was to come. Keep in mind, there is a very good reason why we are not able to see what the future holds, for many of us, it would be a burden too great to bear. Stop and think about it. Picture yourself, when you were young, what would it have been like to have revealed to you all of the trials you would face during your lifetime. WOW! Would it not have been too much to bear? For me that would have been the case. I am so thankful the Lord allowed many of my trials to remain hidden from me until the time came for me to face them. It allowed me to enjoy my life prior to the trial and allow me to concentrate on the Lord and His service rather than being constantly obsessed with the future and what trials I would have to face. Folks, we need to thank the Lord for not being able to know what the future holds for us. Although we know He will be with us every step of the way, if we know all the trials and heartaches that would be coming our way, it would be very difficult indeed. Likewise, we need to be thankful that the Lord DOES know what our future holds for us. In that way, secretly, He is able to prepare us for what is to take place while still keeping us from days, weeks, or years of anxiety anticipating the trials that are yet to take place. Then, when His timing is right and His secret work of preparation was complete, He then allows the trial to come and accompanies us every step of the way. What a wonderful Lord we serve. It is this same Lord that is constantly at work in our lives, preparing us for what lies ahead. He will lead and guide us every step for the way as we enter the New Year and the unknown events that it holds for us. Our future holds events of which we not have prior experience. As we progress through our lives, we all will face situations of which we have no previous life experience. In many cases, these are the most fearful of all situations we must face. It is one thing to face a situation of which we are experienced and have a basic idea of how to successfully proceed; but, it is entirely different to face a dilemma which comes upon us unexpectedly and we have no past life experience to guide us. When we go through these times of inexperience, uncertainty, and anxiety, we are reminded of our inability and great need of our Lord. But beyond working humility in our lives, it also reminds us that experience is a wonderful, and in many cases, unappreciated gift from God. Experience provides us with much wisdom and understanding of how to fulfill God’s will for us as we pass through life’s difficulties. Experience supplies boldness and confidence in the face of difficult life issues. There are many of us that look at old age as a burden to be borne and a hindrance to Christian service, but from the standpoint of experience and wisdom, old age is actually a great blessing that can enhance our service to God. When we are faced with unfamiliar life problems, we should always remember this is a wonderful opportunity for the Lord to teach us much needed wisdom in this area. Then, with that wisdom we will be able to deal with similar circumstances in the future, as well as help others who are faced with the same type of life situations. Gaining experience in dealing with life’s problems should be looked upon as a great blessing with a heart of gratitude for the Lord leading us into this new life issue, thereby gaining valuable tools to help us and others as we live our lives for Him. With the coming of each New Year, we are reminded of the quickly passing time and shortness of the physical life that we possess. For some, the concept of a short lifespan on earth is a thing of dread and fear. They possess dread because they know that the pleasures, possessions and relationships of this world will quickly pass away; and fear, due to confusion and uncertainty about, and an unpreparedness for, a coming afterlife. However, in comparison, there are those who recognize that life is only temporal and will be followed by an eternal existence that will offer a much better existence. These have prepared for its coming and joyously await its arrival. As we come face to face with another New Year, I just wanted to take a few moments to review the Biblical teachings on the temporal nature of life on earth and the great need to prepare for a coming afterlife while the opportunity still exists for each one of us. Job, in our text, describes the quickness of the passing of our life as “we are but of yesterday”. In other words, Job is simply saying that, as we look back to the past events of our life, from birth onward, they seem to have just taken place “yesterday”. How very true this is! On this New Year’s Day, stop and think about the past events of the previous year. For most of us, these events seem like they took place just yesterday. Now, stop and think about some of your major life events that have taken place throughout your lifetime: births and deaths; sicknesses; new jobs and residences; anniversaries and graduations; and, for the Christian, the moment the Lord brought you unto Himself, trusting in Him for salvation. As you think about all these events, do they not seem to have taken place just a short while ago? For many of us, even the events of life that took place 30, 40, or even 50 years ago, now seem to be fresh in our minds and hearts, as if only a few days have passed. Job even goes further in emphasizing the brevity of life when he says… “our days upon earth are a shadow”. See also: (Job 7:6, 9:25, 14:2; Psa 78:39, 89:47, 102:11; Isa 40:6). Understanding the two basic characteristics of a shadow help us to understand what Job was trying to teach us. First of all, a shadow lasts only a short period of time, much like our life in comparison with the eternity that is to follow. Secondly, a shadow is constantly changing (due to movement of the person casting the shadow and the orbiting of the sun)… this pictures for us our temporal life and the many changes that take place on a day by day basis. Folks, looking back over this last year, we all know people who have passed on unexpectedly. Whether it be by accident, sickness, or the actions of another, every day people pass on before us suddenly with absolutely no prior warning. Perhaps, they expected to celebrate the coming of this New Year along with us but, sadly, they are no longer with us. In this fallen, sinful world unexpected deaths are a very common occurrence. With the passing of this, and every New Year, we are reminded of the changing, fleeting nature of our lives. The most important aspect of these life principles is the need to take advantage of the time we have been given on earth and use it wisely. 3. It is by grace through the God-given gifts of repentance and faith that a sinful man can receive forgiveness and salvation from the punishment of their sins (Acts 3:19, Acts 11:18, Eph 2:5-8. 1 Thess 1:10). 4. The newly forgiven individual is adopted into God’s family, made a citizen of the eternal, spiritual nation of Israel, and made heirs of an eternal existence with God. This forgiveness, and the blessings that accompany forgiveness, are eternal in nature, can never be lost, based upon the completed work of Christ on the cross (Gals 4:5, Eph 2:19, Roms 8:16-17, Heb 10:10). Folks, due to our humanity, we are blinded to life’s unfamiliar, stressful, circumstances that await us. Although we cannot foresee them, they should not surprise us when they occur, for they are a part of living in this fallen world. These unexpected life events cause anxiety and tensions within us. These worrisome times are trials upon any Christian’s faith. However, although they are some of the most difficult times in our lives, they can also be some of the most profitable as well. These are the hidden purposes behind the many stressful times that enter every Christian’s life. Promise #2 – “I will bring” … The Lord will be the One that will bring us to these unfamiliar paths in our lives. Bringing us into ways we do not know is an act of God’s grace and an act of His hand of blessing in our lives. Our Lord loves us so much He allows unforeseen trials to enter our lives to bring (or keep) us closer to Him and grow in strength and knowledge. He does it to be of long-term benefit to His people. This is why our Lord actually leads us into these unexpected times of our lives… He is working for our good and His glory. Just a personal note… Over the years of my lifetime, I have learned that, in some cases, the ending of a trial in my life does not necessarily mean that “better times are ahead”. On the contrary, sometimes the end of one trial was the prerequisite to a greater trial that would swiftly come my way. Although, at the time, facing a consistent stream of trials seemed to be overwhelming and even unfair; I now realize that many times the Lord bought the earlier trials in my life to prepare me for the greater trial that was to come. Without these preliminary smaller trials, I would not have been spiritually strong enough to handle the greater trial that I was destined to face. Please always keep this in mind…. As we pass through each surprising difficulty in life one of two principles is at play. Either, it is the Lord wanting to bring us closer to Him so we can live a more useful, blessed, peaceful life in the near future; or else, He is graciously equipping us for a greater trial that is yet to come, that otherwise would be far too great for us to bear. In either case, the Lord leading us into this time of unpredictable hardship is an act of His grace, working in our lives what is for our good and securing for us eternal rewards as we faithfully walk through our life’s trials with Him. May we all look ahead to the unknown events of this New Year without fear. Instead let’s look ahead with joy, confidence and faith knowing our Lord will be with us and enabling and caring for us every step of the way as He brings us closer to Him and enables us to handle any hardship that may come our way. Are You Prepared For The Unknown That Your Future Holds? December 26, 2015 7:00 pm / 2 Comments on Are You Prepared For The Unknown That Your Future Holds? 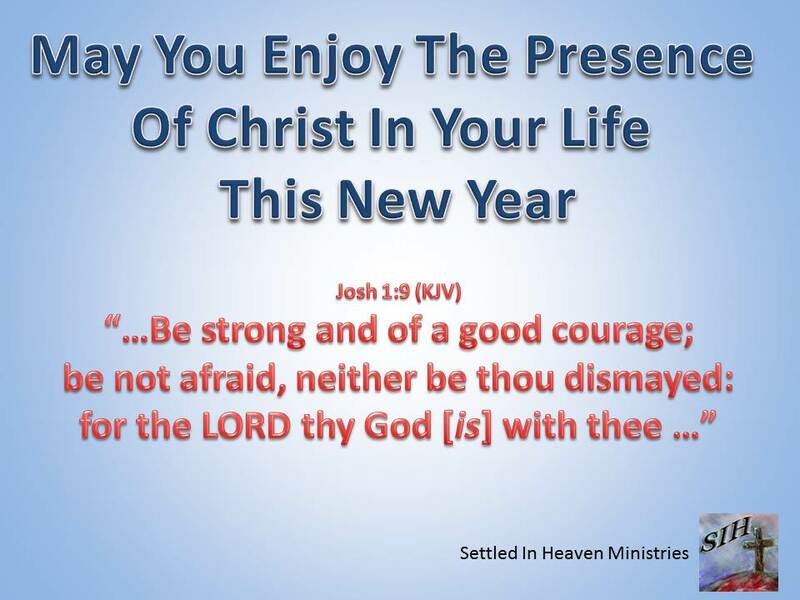 Happy New Years For Settled In Heaven Ministries! 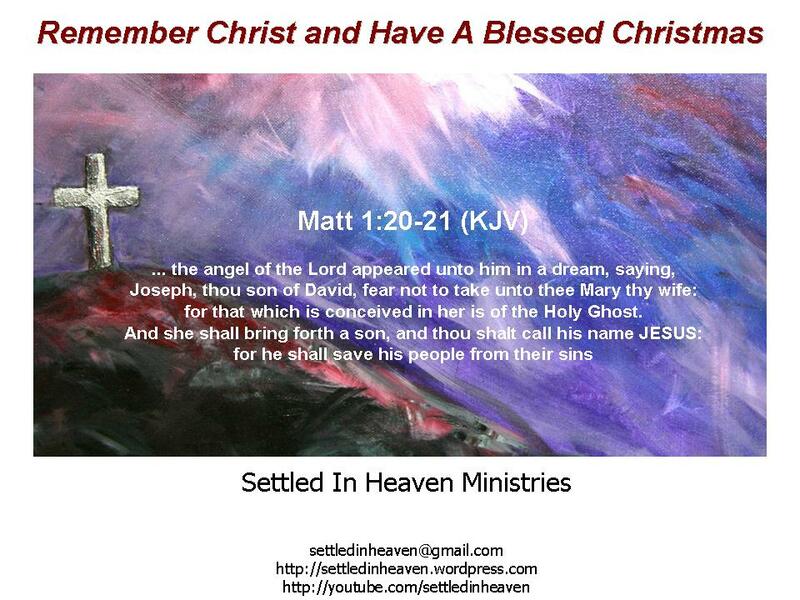 December 26, 2015 10:00 am / 3 Comments on Happy New Years For Settled In Heaven Ministries! Our Uncertain Future… Faith Is The Key! Mat 6:25-34 KJV – “Therefore I say unto you, Take no thought for your life, what ye shall eat, or what ye shall drink; nor yet for your body, what ye shall put on. Is not the life more than meat, and the body than raiment? And why take ye thought for raiment? Consider the lilies of the field, how they grow; they toil not, neither do they spin: And yet I say unto you, That even Solomon in all his glory was not arrayed like one of these. Wherefore, if God so clothe the grass of the field, which to day is, and to morrow is cast into the oven, shall he not much more clothe you, O ye of little faith? Principle #4 Faith in the Lord is what allows us to remain faithful to the Lord as we step out into the unknown. These are the four principles that will prepare us the unknown events that this New Year will hold for each one of us. May we all look ahead to the unknown events of this New Year without fear. Instead let’s look ahead with joy, confidence and faith knowing our Lord will be with us and enabling and caring for us every step of the way! May the Lord graciously bless us as we embark on this devotional series. Hallelujah! Christ Has Come And Revealed His Father To Us…. December 23, 2015 7:00 pm / 3 Comments on Hallelujah! Christ Has Come And Revealed His Father To Us…. Throughout this series we will be looking at a Biblical character described as “the Word”. We can easily see from these quotes from our devotional text, and the corresponding references from other parts of the Bible, clearly, without any doubt, our Lord Jesus is the One that is given the title “the Word” in this devotional text. Why was Jesus given the title “the Word”? The Greek word for “word” is the word “logos” – one of the definitions of this Greek word is “an expression” or “something that is said”. In other words, Christ expresses God to man. Through Christ we have God revealed to us. This is much like our words that reveal our thoughts and intents to others. This is the basic reason why Christ is described as “the Word”. Although God is unable to be seen with our physical eyes, (18a – “No man hath seen God at any time”), The Word, Jesus, can reveal God to us. Folks, do we want to enjoy an intimate relationship with God Himself? Then look to The Word, Jesus Christ, His birth, His life, His death and His resurrection. For those of us who have come to a living relationship with God through Jesus Christ… may we use this holiday season as an opportunity to share Christ with those around us. It is during this time of year that the lost world seems to be the most open and receptive to listen and receive our testimony of Christ and all He has done for us. May we all have a blessed holiday season knowing our sins have been forgiven and we are enjoying a close relationship with God through our Lord Jesus Christ. No one can, or will, see the actual being of God. The Word is the One that is the sole, exclusive, Son of God that clearly showed God to man by being sent in human flesh…. He is the only One that proceeded directly from His Father to a sinful, lost, and dying world while retaining the closest possible, unhindered, relationship with His Father. It is this same Word that was given by His Father to be sacrificed for the salvation to His people. From His birth in Bethlehem, through His ascension to the right hand of the Father, we have the love of the Father clearly revealed to all of us. What great love! May the love of the Father be constantly in our minds as we celebrate the birth of Christ into this world!